Grand Prix Series There are 8 products. 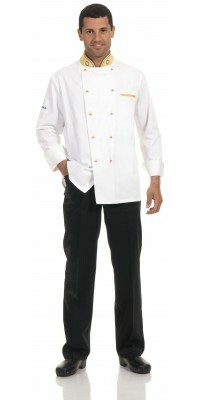 Corbara’s Chef Uniforms: lively style with the colourful jackets and aprons of the Grand Prix series. Created for an international patisserie grand prix – the name “Grand Prix” derived from it – this selection of chef uniforms is suitable for those chefs, ice-cream chefs and pastry chefs who prefer a colourful and visually striking style; in fact, the white of the jacket is matched with a range of colourful details (collar with tricolour outline, buttons, pocket, “Corbara” embroidery on the sleeve, etc. ); the coordinated Apron recalls the colour of the collar and has a tricolour border on the cuff. The uniform is available in two shades: in Golden yellow for the Grand Prix uniforms and in Blue Royal for the Gran Royal uniform. 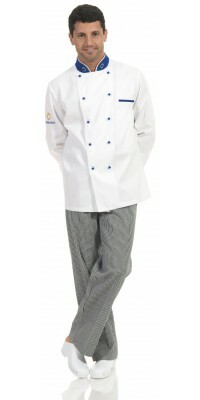 This series of chef uniforms is completed by the Opera Chef Jacket, similar design of Grand Prix with colourful collar, buttons and pocket, but with profile on the collar in white (instead of tricolour outline). The Opera Jacket is available in two colours: Burgundy and Brown, with the Gran Maestro Aprons in the same colour of jacket collar. 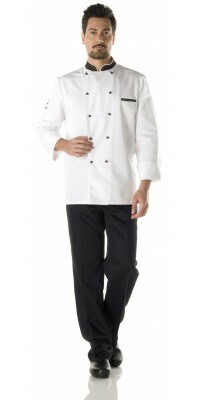 Chefs' jacket model Opera White with brown collar and breast pocket profile Brown pull-out buttons Immediately available for delivery: sizes from S to XL Made of Luxor Rasatello (Satin), 50% Cot., 50% pol. 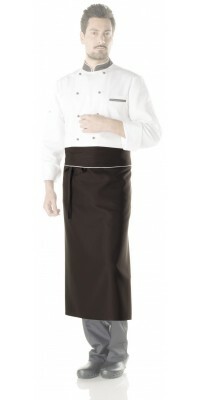 Long apron with waist band, model Gran Maestro Brown, with white profile size cm 85 x 95Made of Gabardine Plus, 100% Pol. 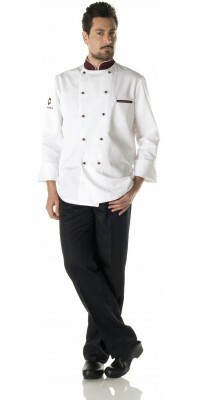 Chefs' jacket model Opera White with burgundy collar and breast pocket profile Burgundy pull-out buttons Immediately available for delivery: sizes from S to XL Made of Luxor Rasatello (Satin), 50% Cot., 50% pol. 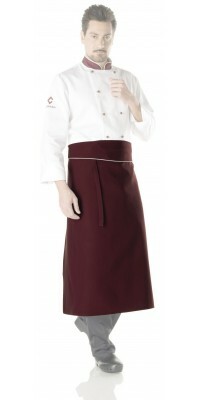 Long apron with waist band, model Gran Maestro Burgundy, with white profile size cm 85 x 95Made of Gabardine Plus, 100% Pol. 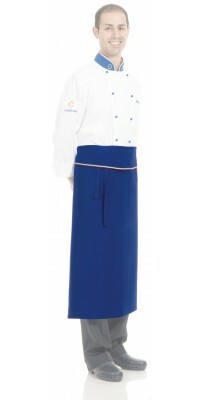 Chefs' jacket model Gran RoyalWhite, with royal blue collar and pocket profile light blue pull-out buttons Immediately available for delivery: sizes from S to XL Made of Luxor Rasatello (Satin), 50% Cot., 50% pol. Apron model Gran Royal, with waist bandRoyal Blue colourwith tricolour profilesize cm 85 x 95Made of Gabardine Plus, 100% Pol. 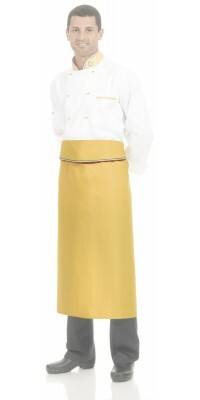 Chefs' jacket model Grand PrixWhite, with gold yellow collar and pocket profile gold pull-out buttons Immediately available for delivery: sizes from S to XL Made of Luxor Rasatello (Satin), 50% Cot., 50% pol. Apron model Gran Prix, with waist bandGold yellow colourwith tricolour profilesize cm 85 x 95Made of Gabardine Plus, 100% Pol.